The psychological assessment is a structured interview that gathers information from and/or tests a person to evaluate a mental health complaint. Once complete, the assessment will help establish either a tentative or definitive diagnosis . With this information, the clinician can inform the patient of the results, and treatment can begin. This consists of questions such as "Why are you seeking psychological help today?" that reveal past mental disorders and/or the symptoms that made the person seek psychotherapy . The patient's responses can also help the clinician ask pertinent questions during other parts of the interview, and can help clarify the presence of symptoms. Because medical problems—including thyroid disease, Parkinson's disease, head trauma, and brain infections—can cause psychological symptoms, a thorough medical history must be taken. The interviewer also asks about previous psychological/psychiatric treatment, including hospitalization , outpatient or substance abuse treatment, and medication prescribed for mental disorders. The treatment's duration, effectiveness, and outcome is also noted. EARLY CHILDHOOD (INFANCY–THREE YEARS). Questions include information about temperament, walking, talking, toilet training, nutrition and feeding, family relationships, behavioral problems, hospitalization, and separation from early childhood caregivers. MIDDLE CHILDHOOD (THREE–11 YEARS). Pertinent information will be gathered concerning learning, relationship with peers and family, behavioral problems, and general personality development. ADOLESCENCE (12–18 YEARS). Information typically includes school history, behavioral problems, and sexual development. ADULTHOOD. This section details the patient's education, sexual history, relationships and/or marriages, peer relationships, occupation, and current circumstances. Family history is crucially important since many mental disorders can be inherited genetically. Additionally, family interactions may affect the patient's symptoms and disorder. The psychological assessment (also called the biopsychosocial or psychiatric assessment) gathers information to diagnose any mental disorder that the person may have. A complete psychological assessment should include: complete and extensive medical and psychological history, neurological assessment, and may also include further tests and imaging studies. Once complete, the assessment will help establish a diagnosis. This portion of the psychological assessment details information on the patient's use of both illicit drugs (opiates, cocaine, alcohol, marijuana, hallucinogens, and depressants) and legally prescribed medications, as well as nicotine and caffeine. Questions usually focus on age of first use, age of last use, period of heaviest use, usage within the past 30 days, frequency, quantity, and route of usage. Tolerance and dependence, if present, are noted, as are the patient's treatment history, any medical complications (AIDS, for example), and legal problems associated with usage (such as driving or operating a vehicle or machine while impaired). Appearance—hygiene, general appearance, grooming, and attire. Behavior—abnormal movements, hyperactivity and eye contact with the interviewer. Speech—fluency, rate, clarity, and tone, all of which may indicate the patient's mental state. A fast-talking person, for example, may be anxious. Speech can also reveal intoxication or impairment as well as problems in the mouth (i.e. dentures, cleft palate) or speech impairment. The examiner then goes on to assess other aspects of the patient's mental state, such as mood, thought process, and cognition, beginning with a question such as that suggested in the Merck Manual of Geriatrics." I would like to ask you some questions about your feelings, your thinking, and your memory as a routine part of the examination. Is that all right with you?" These outward manifestations of the patient's mental state are important indicators. 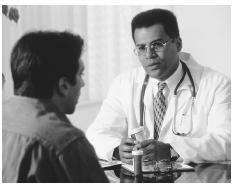 The clinician can ask the patient to describe his or her current mood ("How do you feel? Are you happy? Sad? Angry?"). The patient's affect, or emotional state, however, is observed and interpreted by the clinician throughout the interview, and described in standardized terms, such as excitable, flat, inappropriate, or labile (rapidly shifting). Thought process (or form) indicates whether or not the interviewee is properly oriented to time and place. Thought content reveals how connected, coherent, and logical the patient's thoughts are. The interviewer may ask the patient to identify themselves and loved ones, to name the current date, and/or to describe the route taken to the examiner's location. The patient's responses to questions can indicate disturbances in thought, such as circumstantial thinking (circuitous, persistent storytelling), tangential thinking (response not pertinent to the question) black/white (extreme) thinking, and impoverished (minimally responsive) thinking. Disturbed thought content can also indicate delusions , hallucinations , phobias, and obsessions. In addition, the examiner may question the patient about suicidal and/or homicidal thoughts. Cognition refers to the patient's attention, awareness, memory (long-, intermediate-, and short-term), general knowledge, abstract thinking ability, insight, and judgment. The interviewer may ask the patient to spell a word forward and backward, identify the current president, read and/or write something, compare two objects, and explain the meaning of common sayings. An evaluation session appointment is made with a qualified mental health practitioner. A specialist (someone specializing in anxiety/depressive disorders, pain management, hypnotherapy , or chemical dependency, for example) may be sought or recommended. A private, quiet, nonthreatening, environment is recommended to ensure comfort and confidentiality. The person suffers from a mental disorder that may require psychotherapy or a combination of psychotherapy and medications. Tasman, Allan, Jerald Kay MD, and Jeffrey A. Lieberman, MD, eds. Psychiatry. 1st ed. W. B. Saunders Company, 1997. I THINK IT WOULD BE BETTER IF THERE IS A EXAMPLE OUTLINE FOR FURTHER UNDERSTSANDING OF APPLICATION OF THE TESTS OR SAMPLE PATTERN FOR FURTHER UNDERSTANDING OF THE INDIVIDUALS WHO WANT TO STUDY OR FURTHER LEARNING OF THE STUDIES.THANK YOU AND MORE POWER TO THE STAFF.YOUR PATIENT DOING ALL THESE THINGS POSSIBLE TO ENHANCE THE MENTAL HYGIENE FOR EVERYONE.GOD BLESS.